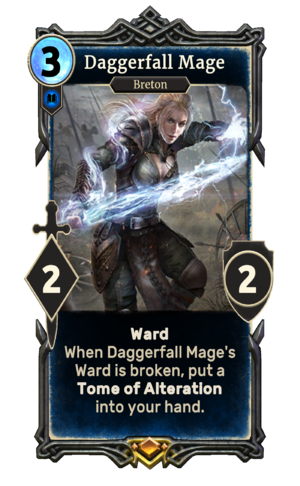 When Daggerfall Mage's Ward is broken, put a Tome of Alteration into your hand. Daggerfall Mage is a legendary Intelligence creature card. It is part of the Core Set. "By the Eight, they will meet their makers!" "By the fires of Oblivion!" The card is named for the High Rock city of Daggerfall. This page was last modified on 15 February 2019, at 00:21.